Lachlan Davidson is a musician involved in many aspects of music. 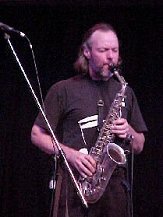 He performs Jazz- Trad, Standards, Original, Funk, Commercial- sessions, TV, concerts, functions, Classical- Sax Quartet, Orchestral, Contemporary. Ethnic- Greek, Italian, Jewish, Brazilian. He teaches, conducts, tutors, composes, arranges and loves music. Lachlan is a reading musician who doubles, an improvising jazz musician, a classical musician, a frequent deputy for other players or an addition to existing groups, and equally at home in an ensemble or as a soloist.He is committed to music for music's sake. Instruments played: Alto, tenor, baritone & soprano saxophones, flute, piccolo, oboe, clarinet, bass clarinet, some trumpet and piano. International Artists supported: Stevie Wonder (featured), Mark Levine, Ray Charles, John Denver, Herbie Man, Glen Miller Reunion Band, Eartha Kit, Du Du Fischer, Frank Sinatra, Randy Crawford,Larry Elgart, Steve Lawrence, Edie Gormet. Shirley Bassey, Louis Bellson. "It is a great honor to step into this world which is so different to my regular one and work with such fine musicians and good guys. It's also great fun performing vibrant music to so many people and trying (often unsuccessfully) to dance at the same time."